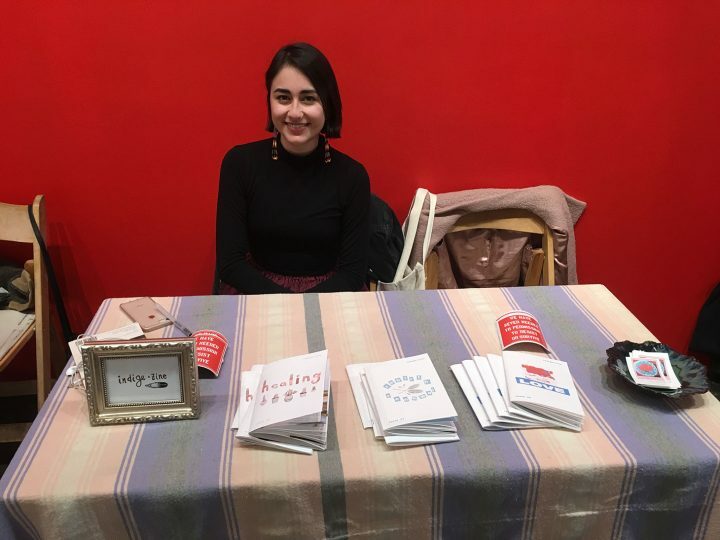 A small zine fair at Clinton Hill-based art space Recess highlights the importance of Indigenous creators and their work. This past weekend, Brooklyn-based art space Recess hosted the Collective Fury zine fair, featuring work by Indigenous artists. The fair was small, with a few tables set up in the space and multimedia artist Jeffrey Gibson’s tunic hanging in back. The work on display, though, was certainly noteworthy. I first spoke to Braudie Blais-Billie, who runs a zine called Indige•Zine, which started in 2016 as a benefit for the Dakota Access Pipeline (DAPL) protests. The zine, run entirely by Blais-Billie, is a platform for Indigenous identity art, featuring the collections of Indigenous creators. Currently on its third issue, titled “rebirth:renewal,” the zine comes out about twice a year. According to the Indige•Zine website, the issue “celebrates the growth in starting new, reinvention, and moving forward.” Inside are works of poetry, visual art, fashion design, and more. The issue is available digitally here and can be purchased for $10 on Etsy. Another publication on display was unbag magazine. Addison Vawters, who works on the magazine’s development, told me that the unbag Collective began five years ago, while the magazine itself is three years old. The collective began with critical conversations about the intersection of art and politics, and through that, the magazine was born. Issues come out once every seven months and feature critical essays, visual art, and creative writing. The third and latest issue, titled “Reverie,” is available online and in some New York City bookstores. In addition, unbag Collective distributes smaller zines by their members and friends. All in all, while the space itself was small, the works inside were certainly important, and by providing a space for the Collective Fury Zine Fair, Recess and R.I.S.E. showed their commitment to promoting the work of Indigenous artists and writers.